It is often said that the more things change, the more they stay the same, and the truth is that the latest gameplay video for Bioware’s upcoming video game Mass Effect Andromeda does look erringly familiar. Because while this new game in the renowned Mass Effect series might be set in a new galaxy and feature a new protagonist named Ryder instead of the grizzled hero Commander Shepard, almost everything else seen in Bioware’s gameplay video (which was released during this year’s Game Awards) looks similar to what fans have already seen in the three Mass Effect games released to date. In the trailer, we see that Mass Effect’s traditional dialog wheel will feature in the game, plus there will also be QTEs (Quick Time Events) like in earlier games in the series, as we see in one scene in which Ryder has to disarm a Turian guard to get out of a sticky situation in this gameplay video. Also, a variant of Shepard’s Mako (the all-terrain vehicle seen in the first Mass Effect) will be making a return, and looks like it will come handy for exploring planetary surfaces in the game. Mass Effect Andromeda’s third-person combat also looks very familiar, featuring the same mix of shooting and biotic powers, although hopefully it won’t be the weak link in this game as it was in the original Mass Effect trilogy. 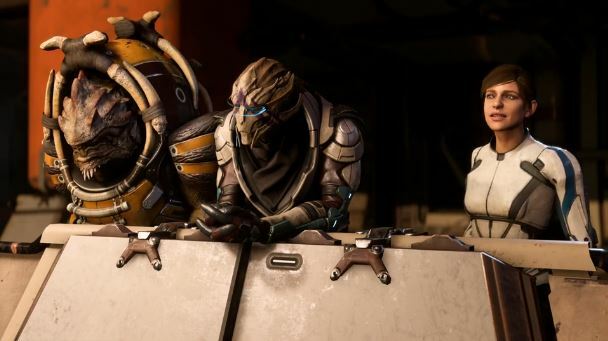 Of course, no one can blame Bioware for sticking to the formula that made earlier Mass Effect games so popular, and it’s clear that Mass Effect’s story, characters and interesting worlds to explore have always been the series’ highlights, so it won’t necessarily be a bad thing if Mass Effect Andromeda delivered more of the same when its released next spring.